"Now relax. This won't hurt a bit…"
Scientists at the University of Southern California have invented the world's first plasma blowtorch - and they want to use it in your mouth. 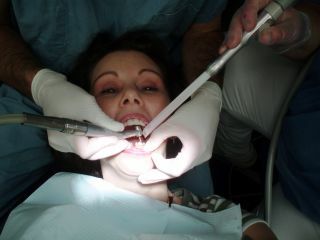 Plaque, it seems, is no match for the dental probe, which is set to propel dentistry into the future. Described as a "cross between a lightsabre and Listerine", the torch fires short pulses of plasma at your teeth to annihilate bacteria. Fortunately the gasses ionize and cool before they can burn you, otherwise things could get pretty painful. And because it's so fluid and adjustable, the probe can zap bacteria in the most hard-to-reach places. So far, dentists have only used the tech to sterilise a tooth during a root canal, but - ominously - the inventors claim to already have other uses in mind. In other news, the Xbox 360's new motion-sensor technology was this week accused of struggling "with dark-skinned people". Project Natal failed to properly read the steering actions of a testing games consultant – despite working "just fine" for other journalists. A follow-up report has found that near-infrared spectroscopy tech does indeed have a problem detecting darker skin. "Melanin clearly interferes with the quality of the reflected NIRS signal," it states. Also this week: Canadian scientists say a "giant inflatable tower" could carry people to the edge of space without the need for a rocket. The proposed 15km-high tower would be constructed from inflatable pneumatic modules, giving tourists a view similar to that from space, without the trials of zero gravity. Back in the UK, Heinz has unveiled the world's smallest microwave: the Beanzawave. Powered by USB, the 7.4x6.2x5.9-inch device apparently uses a combination of mobile phone and radio frequencies to cook your beans/curry/pizza [insert as necessary] at your desk. The Israeli military have upped their surveillance and reconnaissance efforts – with an exploding robot snake. The self-propelling, two-foot long machine can slither, slide, and even stand erect to see over obstacles with its head-camera. Just don't try and befriend it: early prototypes have been wired with explosives. Is this the coolest lawnmower you'll ever see? Husqvarna's concept ride-on mower is made of recyclable materials and, claim its makers, represents the future of cutting your lawn.